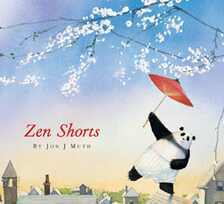 The other night, my 5 year-old son brought his new book “Zen shorts” written by Jon J Muth to me for reading, And the word “zen” just caught my attention, hmmm, Zen for kids? One of the stories told here is actually my favorite among many zen stories simple but quietly striking teaching for your mind deep. I like to enjoy this with you and maybe your little ones. “The heavy load”, story goes…. “I set the woman down hours ago,” the older monk replied. We carry many things, many worries and angers etc…don’t you feel that heavy load still on the body, which creates the enormous amount of the burden physically and emotionally as well? Now take a deep breath and hold a bit and exhale through your mouth with ‘haaa’ sound – with that out-breath, unload all the weights. The very unique and special power of Zen story is that it gives you continually thinking mind a temporary stop and in turn the space…the emptiness and then every one has a different question and answers rising – there is no one right question nor answer.